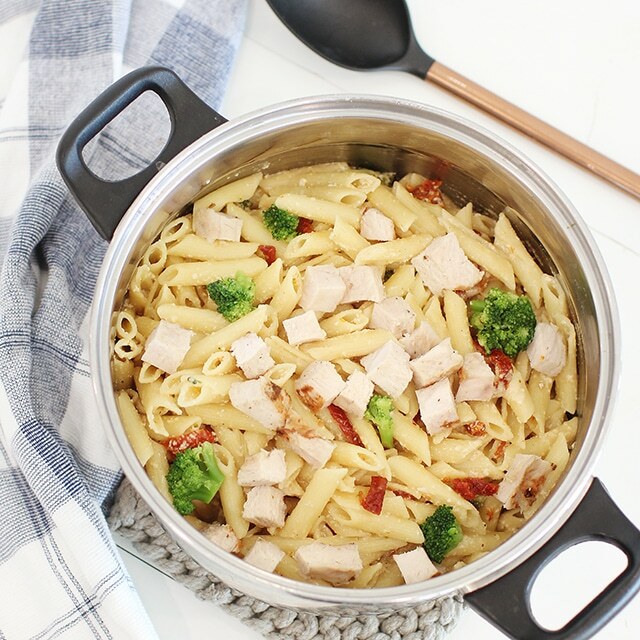 A Quick ‘One Pot Meal’ that your family will love: Chicken and Veggie Pasta! Have you discovered one pot meals yet? Dump some ingredients all in one pot, let it cook together, and in the end you have a complete meal with minimal clean up! 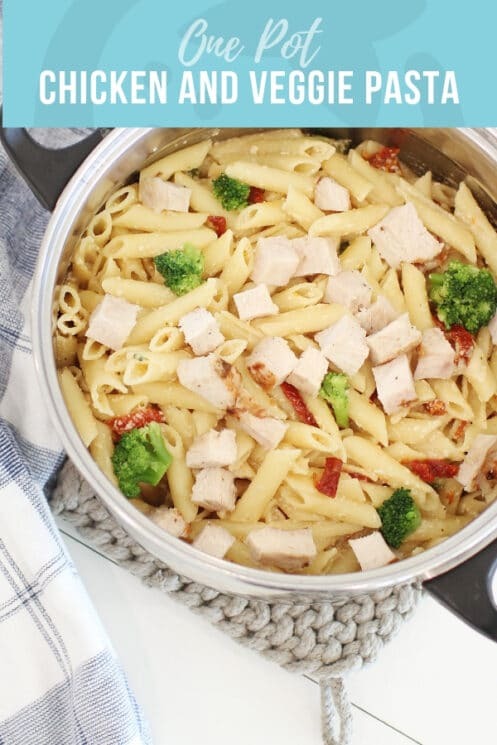 We love one pot meals here and this chicken and veggie pasta is a dish that keeps returning in our line up of favorite dinners. With one pot meals, the possibilities are endless. We usually take a protein, a grain, and some veggies to make a huge variety of combinations and flavors. For this dinner idea, we used chicken, pasta, and broccoli. 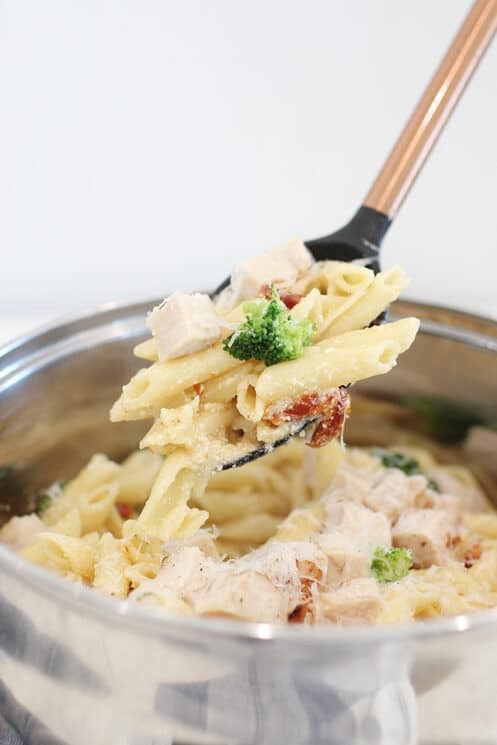 Although these are three foods that always go well together, we included some creamy, cheesy flavors as well as some sun dried tomatoes to really get my kids excited about it. 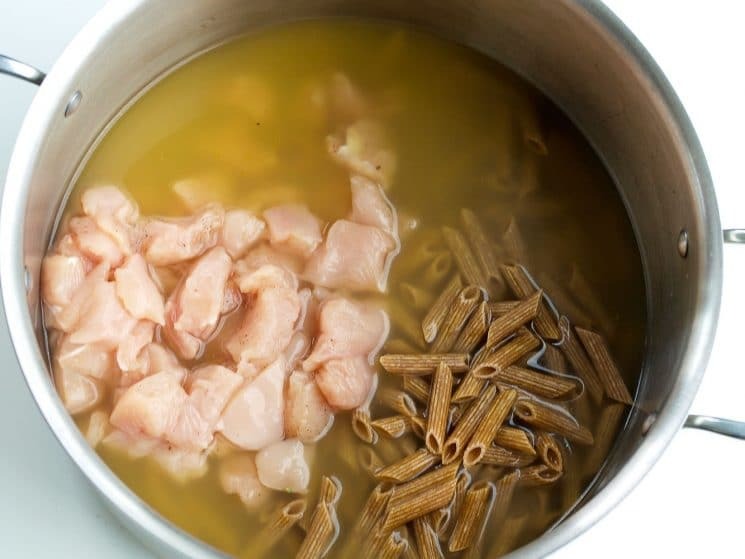 I’ve played around with the method and the ingredients and have found when the pasta cooks in chicken stock it lends the best flavor. The pasta’s starch helps thicken the sauce naturally. It’s creamy, but doesn’t have any cream! I made a healthy swap and used Greek yogurt, which gives us a similar creaminess, but is much lighter. 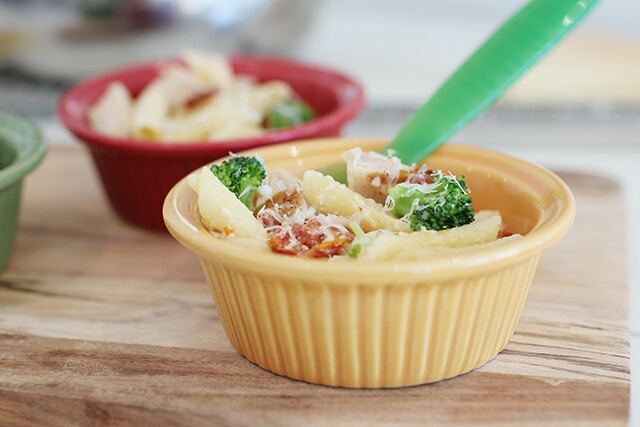 If you have a pasta-loving kid, this recipe is a great way to help them enjoy broccoli. I’ve found that if you have a food your child is reluctant to eat, it’s much easier to have him accept it if you pair it with a favorite food. 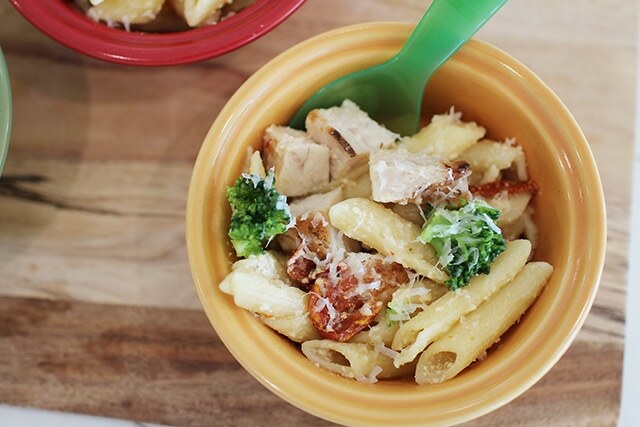 In this case, creamy and cheesy pasta makes broccoli much more appealing than it normally is to an average kid! Yes, this is a delicious dinner. But what really makes the one pot pasta recipe a winner is how quick and easy it is. Start to finish, you can have a complete dinner (that everyone loves!) ready in 30 minutes. You must try this! I don’t know how well it would freeze because of the dairy. Can you make this vegetarian without the chicken? Would you need less liquid? Instead of Greek Yogurt ( since my local grocery doesn’t carry it) I used Sour cream. Also ( same grocery store) didn’t have sun dried tomatoes so I instead used canned diced tomatoes with garlic and oregano. It turned out absolutely amazing!! Family ate every bit of it! This is definitely going down into the cookbook! Thanks so much! This was surprisingly amazing! I used an extra cup of stock and swapped sundries tomatoes for spinach and also added some garlic. Even my VERY picky husband enjoyed this! Yum! Tried this tonight and my family really liked it. We’ll be eating this again. Thank you! Would this work as a vegetarian dish without the chicken? How would I need to adjust the liquid? My box of pasta is 12 ounces. How much do you think I should increase the liquid (broth and yogurt) to account for the 4 extra ounces? Does the Greek yogurt curdle? Chicken stays most and family loved it!!! Super quick, easy, and delicious! Chris and the girls liked it. Chris wanted more parm cheese. he liked the sauce (the greek yogurt). Next time cook the pasta seperate (in the broth) so that it doesn’t fall apart) in the big pot.